The earliest reference to dance in Irish history details a visit between the Mayor of Waterford and Mayor of Baltimore. A processional combination of singing and dancing took place called carolling which originated from European folk dance histories and was thought to be introduced to the Irish by the Normans when they arrived in 1169. The year of 1598 saw dance reels beginning to be published in a work entitled News from Scotland. The reel which is thought to be mostly Scottish in origin was said to be named after the Swedish ragla, which means to stagger, incline or move while walking, first to one side and then the other. The Irish Jig is widely accepted as Irish in origin and was likely to have originated from an Irish Clan marching tune. The first jig was published by John Playford, a music publisher and choirmaster of St. Paul’s Cathedral in 1986. Queen Elizabeth I was a very public advocate of the Irish Jig. 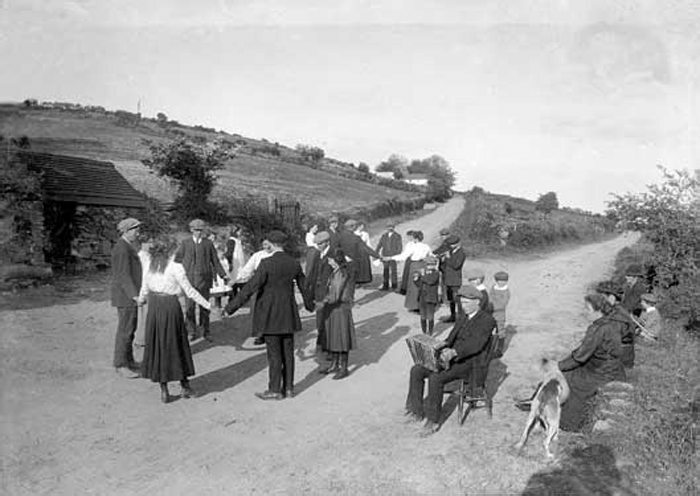 The three most popular dances mentioned in Irish records from this time include the hay, the rinnce fada (rince is the Irish word for dance) and the rinnce mór. The hay was thought be to circle or chain dance where people would chain in and out of each other in a circle. The first mention of the Irish rinnce fada, which means the long dance, was recorded in 1689 as it was danced in honour of the arrival of James II to Ireland. It was believed he was already familiar with the dance which suggests it was already in practice long before this time. 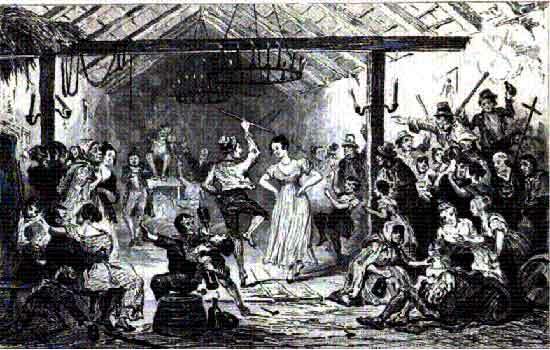 The Irish people’s love of dancing has been well documented throughout the ages but perhaps John Dunton, an English bookseller and author, put it best when he wrote; ‘on Sundays and Holydays, all the people resorted with the piper to the village green, where the young folk dance till the cows come home. There was no occasion from which dancing was absent’. The dance of the hornpipe is first mentioned in the time of Henry VIII by Chappell. This dance in particular, is generally excepted by most as being of English origin and is believed to have arrived in Ireland around the 18th century. This era saw the introduction of the Irish Dancing Masters who travelled the country to teach their trade to the masses. They were strongly aware of and influenced by French dancing etiquette manners and deportment. These modern forms of dancing were adapted by the Irish Dancing Masters and passed on to their pupils who came from families of all classes throughout Ireland. 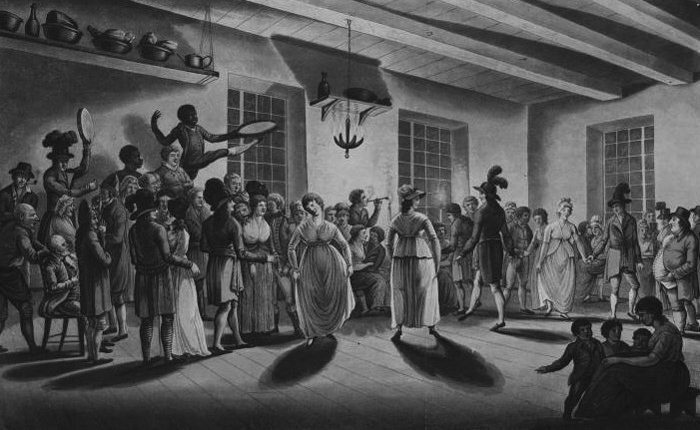 The Dance Masters taught a variety of dance principles from simple steps required for crossroad dancing to the more complicated French cotillions and quadrilles, all of which evolved into country set dances, with each locality adding their own characteristics and preferences. The Gaelic League was founded in 1893. After centuries of British rule in Ireland, the aim of the League was to recreate a separate cultural Irish nation where the use of all English language, culture, games, dress, literature, music and dance was eliminated. 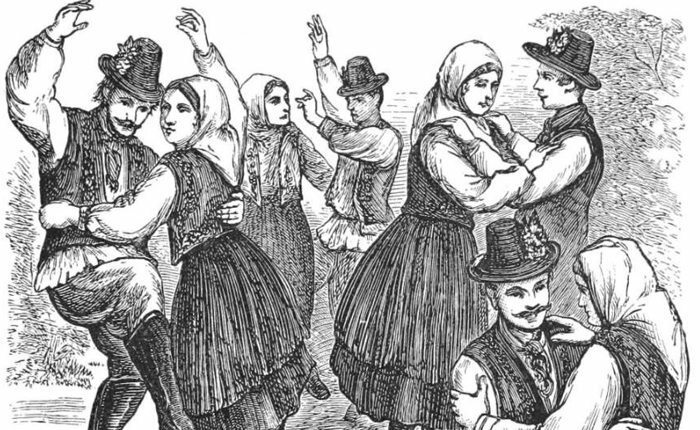 While its aims were admirable, the order banned many dances which were popular at the time including round and country dances as well as quadrilles. The year of 1897 marks the first ever public Ceílí which took place ironically, in London’s Bloomsbury Hall, organised by the Gaelic league, at which sets, quadrilles and waltzes were danced to Irish music. This year saw the formation of the Gaelic Dancing League which endeavoured to resurrect some of the dances they had caused to disappear. When this was not possible, they composed others in their place. These included the Walls of Limerick and the famous Siege of Ennis. In 1935, the Public Dance Halls Act was enforced which required all public dances to be licensed and laid down the conditions under which licenses might be issued by district justices. With the act came the end of a way of life in rural Ireland where dances in neighbouring houses were commonplace. Despite another obstacle to the growth of the culture of Irish dancing, the raw nature of set dancing did survive in the parts of Ireland which most valued tradition including counties Clare, Cork and Kerry. The formation of Comhaltas Ceoltóirí Éireann, meaning the Society of the Musicians of Ireland, which were dedicated to the promotion of music, song, dance and language in Ireland, lead to the strongest revival of interest in traditional Irish music and dance on record. People danced Ceílís and sets across the country and in the years to follow the movement inspired the rise of great Irish Ceílí bands like the Kilfenora, the Tulla, the Aughrim Slopes and the Castle. 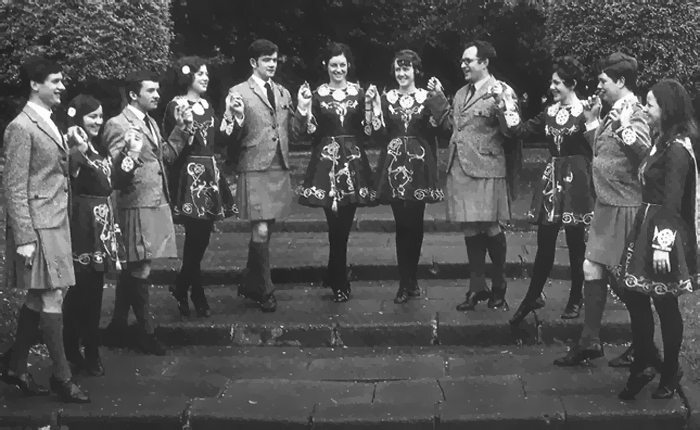 In 1970, the birth of the Gaelic Athletic Association, a sub division of Comhaltas organised competitions where teams of dancers from around the country gathered together to share their own style of set dancing to all. This too inspired other communities to foster a pride in their own unique take on Irish dancing and look for and revive their own style of sets. This decade saw a huge increase of set dancing workshops and set dancing Ceílís around the country of Ireland, with even GAA and ruby halls becoming practice grounds for Irish Dance and its pupils as the infectious nature of the craft captured the hearts of many. This spirit and enthusiasm for the culture of Irish dance is something that still to this day, remains strong in schools and communities across the country. Research taken from Toss the Feather – Irish Set Dancing by Pat Murphy.